Sylvania consists of two areas: The federally designated ”Wilderness” is located south of the road that runs across the northern portion of Sylvania, the much smaller “Recreation Area” sits north of the road. Sylvania is divided because, by definition, a wilderness may not be crossed by a road. Visitors to the Recreation Area will find a variety of facilities, including a beautiful day use building, picnic areas, a beach, boat launches, and the Clark Lake Campground with 48 auto accessible sites. Across the road, the Wilderness offers 34 named lakes (some with beautiful sandy beaches) and more than 25 miles of hiking trails. You may want to stay for more than a day to explore some of the distant parts of the Wilderness. Fifty rustic campsites are located at 8 lakes (see map of Sylvania for locations) which offer great solitude, but only fire grates and wilderness latrines are provided. Finding the camp sites and portages can be a challenge since the lakes have many inlets and there are few signs or markers. A compass and map or GPS are essential equipment for paddlers and hikers. The Clark Lake Campground and a small number of the rustic campsites are available on a walk-in bases at the Sylvania Entrance Station, the rest requires a reservation through “Reserve America” on line (see link below). All users must pay a user fee between May 15 and September 30. 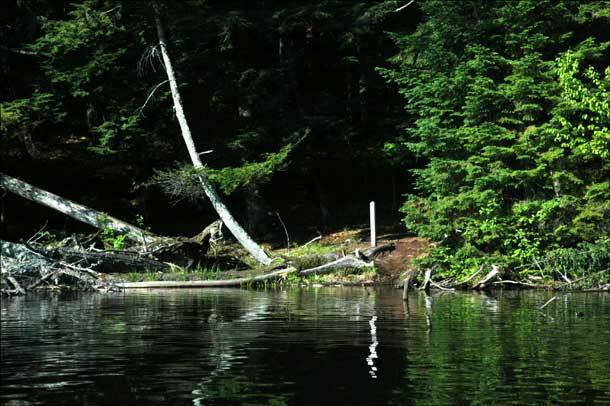 For information regarding permits and fees, go to the Ottawa National Forest's "Sylvania Wilderness and Recreation Area" web page (see link below). If you scroll down to the heading "Activities" (near the bottom of that page), you will find additional information under "Camping and Cabins". Commercial guiding is prohibited in Sylvania (this refers to arrangements in which a person receives direct compensation for his/her service as a guide or leader of a group).